9200 meters of city walls commissioned by Duke Ercole I d'Este and built between 1493 and 1505 with walking paths; as in Lucca, you can bike and walk around them. 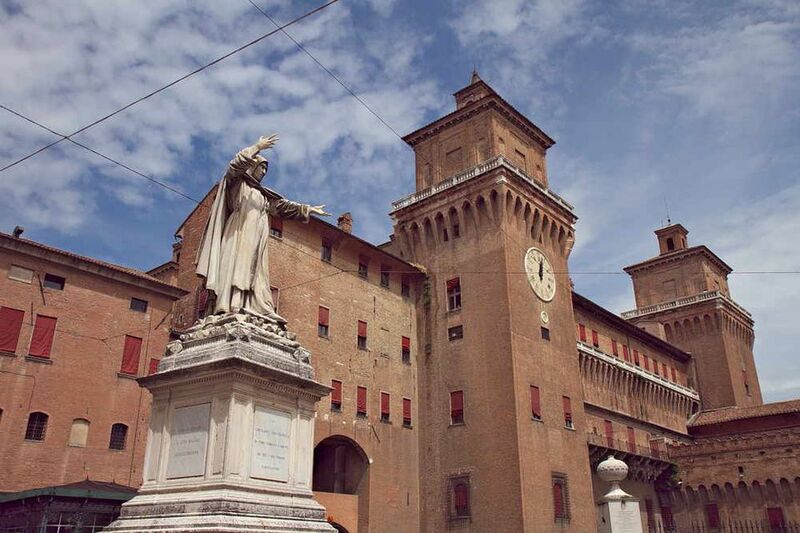 For a map, download the PDF file on this page: Ferrara city walls. Ferrara is on the Bologna to Venice train line--33 trains a day originating from Bologna pass though Ferrara each weekday. Ferrara is an hour and a half by train from Venice. It is an hour to another interesting destination, Ravenna. By car from the direction of Bologna, take A13 north. From Venice, take A4 southwest to Padua and continue on A13 south to Ferrara. Bus info for Ferrara and the surrounding area is available at telephone 0532-599492. The bus from Modena takes one and a half hours. The history of Ferrara as a city dates back around 1300 years when Ferrara was a Byzantine military castrum (fortified city). In 1115 Ferrara became a free commune and in 1135 the Cathedral was built. The Este family ruled Ferrara from 1208 to 1598, constructing many of the monuments we see today. Under the Estes, Ferrara became a center of the arts. Leonardo da Vinci, Raphael, Titian, and Petrarch, among others, spent time under their patronage. But the Estes lacked a male heir. So the Pope claimed Ferrara and it became part of the Papal States, beginning a three-decade decline before awakening in the 1900s, seemingly becoming aware of its own glorious past. Now the city is looking pretty spiffy and awaits your visit. Ferrara is easily visited as a day trip if you're already bedded down in Venice, Bologna, or Ravenna (to see the mosaics). On a recent visit to Ferrara, we enjoyed the Hotel Annunziata and its views of the castle. Compare prices on other Ferrara hotels via Hipmunk. If you prefer a vacation home or apartment HomeAway offers over 40 Vacation Rentals in Ferrara. Usually, in May, Ferrara advertises a Palio they say is the oldest in the world. The weeks before the palio race, competitions in flag throwing are held. Read more about Flag Throwing in Italy and Ferrara and see the Flag Throwing in Ferrara video. See a Ferrara Map marked with the major attractions. Get a map and information on Emiglia-Romagna Itinerary that includes Ferrara.